US, 1984, 90 minutes, Colour. Sophia Loren, Daniel J.Travanti, Edoardo Ponti, Philippe Noiret. 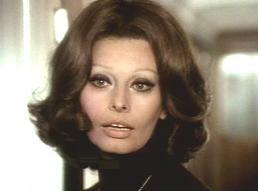 Aurora is a pleasant telemovie, a star vehicle for Sophia Loren. She teams with Hill Street Blues star Daniel J. Travanti and the film introduces her son, Edoardo Ponti. The plot-line is farfetched - but doesn't matter too much while the film is on the screen. Aurora needs money for her blind child and she goes to possible fathers to persuade them to give her money. This all happens in colourful Italian settings. There is true romance and love - and the inevitable happy ending at the end. It is a bit more enjoyable than it might sound. 1. The appeal of this telemovie? Wide audience? 2. The techniques of the telemovie, the home audience, the soap opera style, lush and attractive locations, the portrayal of characters, issues - with sentiment? 3. The Italian background, the cities, the countryside, the mountains? The beauty of the locations? The score and emotions? 4. The credibility of the plot, Aurora's quest? The timing - at this age of her son? The relationship between mother and son? Possible fathers? painting? Apprehension that Michel would take the money? Her giving him some money? Friendship? The re-meeting of David? Love, clash? Her relationship with Ciro, his techniques for alerting the fathers? His wanting to know his real father? His clash with her? The operation, its success, her son seeing her? The happy ending with David? without her knowing? Seeing her realistically? The unbandaging of his eyes? The return to David? 7. Andre and his relationship with Aurora, his memories, his wife? The wedding, the clash with Aurora, calling the police, the deal, his self-assertion against his wife, the gift of the painting? 8. Michel and his poverty, friendship, the art dealer and his getting a good deal, going on the bike, the cheque, Aurora's gift to him? The memory of his father? 9. David and his work, the bond between himself and Aurora, the challenge to Aurora, the end? 10. The operation, Ciro's fear, hiding in the hospital, his mother's search, the staff, the success? 11. The oddball facets of the film - Aurora driving the taxi, the 'daddy' technique, Aurora's shrewdness? 12. The soap opera style, values and stances? Slight but entertaining?